Hello and welcome to my first save here on The Online Desk. First of all I want to say a massive thank you to Paul for letting me guest write on his site. I am 31 years old, married to an amazingly supportive wife and have 2 amazing children. I am a Leeds United fan…. Don’t hate me. For the last 4 year’s I have been more focused on the Football Manager Mobile series rather then the full fat game. I did try youtube for a number of years but have recently fallen out of love with it. I though I would give blogging a go. So here I go. 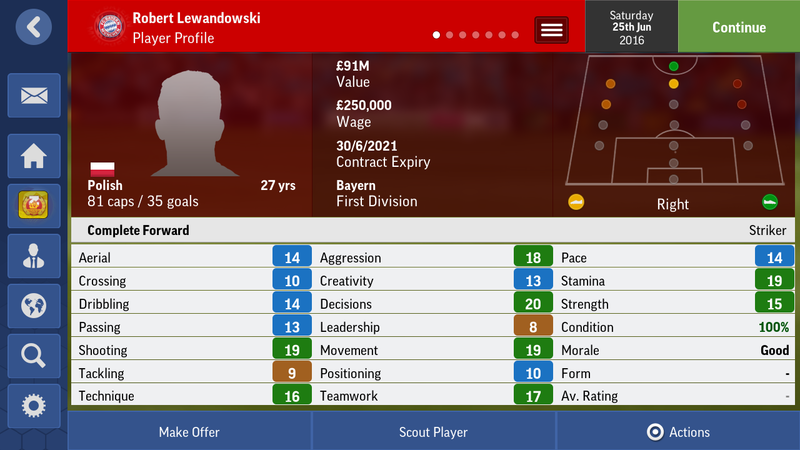 The main aim of this save, along with dominating club football and all of Polish football is to bring Lewandowski back to the club. So after what seems like an eternity of being asked the same question over and over again by the press. Most of them around language barrier and me not being able to pronounce any of my players name. I am taken to see the ground. Oh just one more thing to note this is where the away fan are kept! It’s seem the midfield could be a problem for us and I really need to look at developing the staff I have here as I don’t have the resources to attract much better. I have a decent wage budget but not alot of transfer money to play with but I could move money around if needed to. Not a player you might instantly look at and think ‘get in my team’ but for me he has all I need in a Central Defender at this level. Good in the air, decent tackling, really good at positioning his self and the right amount of aggression. Very good pace and crossing ability. I will have to look at tactics but he will definitely be and huge plus down the wings for us. The man I am tasking to get us the goals. A well rounded players but I might need to look at someone to either play along side him or behind, he doesn’t seem the type of player who would worry a defence by himself. The man between the sticks. I always like a keeper that is a great communicator, along with him being good in the Air and good Strength there was no battle between him an the other lad. This took longer then I thought. I was trying hard to get a formation with winger to work but they just don’t have the depth in certain positions to make it work throughout a season. I decided to settle for this for the pre season and see how it goes. I’m not sold on this working. I am going to give it a go but I think some might struggle with it as the facilities and coaches are low level so it might be something I go back to and change. I am going to be doing my updates on a monthly bases. Where I take a look back over what has happend in the previous month. The next update will include the friendlys and the first league game of the season. As well as any other news to report. So how do you think I will do? Prediction on the results how many do you think I will win, lose or draw? Well that just about does it. If you have enjoyed it don’t forget to drop any like, comment and share. I have been JustM1kePlays and I will speak to you legends soon.